St Cuthbert’s is one of London’s largest and finest 19th century churches. It was constructed between 1884 and 1887 to designs by the architect Hugh Roumieu Gough. Built of brick, with stone dressings, in a style which recalls the monastic churches of the Middle Ages, it rises dramatically amongst the Victorian terraces of Philbeach Gardens, forming a group with the adjacent clergy house and Philbeach Hall. The church suffered damage from Second World War bombs, which blew off the roof. It was reclad in copper sheets after the war. The failure of this material led to water penetrating the interior, putting the building very much at risk. During the 1990s major Lottery grant aid paid for the reroofing of the church using Westmorland slates and the repair of the ornate fleche. The interior of St Cuthbert’s reflects a process of enrichment which extended into the inter-war years and was overseen by the first vicar, Henry Westall, who was in office from 1883 to 1924. The church was designed as a container for rich fittings. Some of these were the work of H.R.Gough – for example, the enormous pulpit and rood loft. Much of the interior decoration, carving in stone and wood, mosaic work and embroidery, was undertaken by craft guilds formed by parishioners in which women played a leading role. 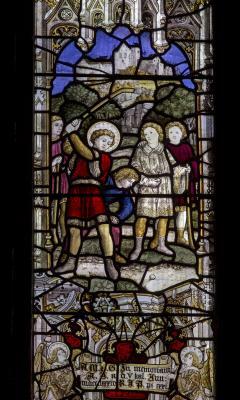 Stained glass by Kempe and Tute further enriched the interior (though some was lost in World War II). The most dramatic of all the furnishings is the enormous reredos, inspired by Spanish precedents, and designed by the priest-architect Ernest Geldart. Designed in 1899, it was finally installed in 1914. St Cuthbert’s significance as an Arts and Crafts shrine is largely due to the work done there by William Bainbridge Reynolds between the 1890s and 1930s. One of the most talented metalwork designers of the period, Reynolds was responsible for the extraordinary clock at the west end of the nave, the screens to the side chapels and baptistery, the altar rails, Paschal candlestick, the Royal Arms and much else. 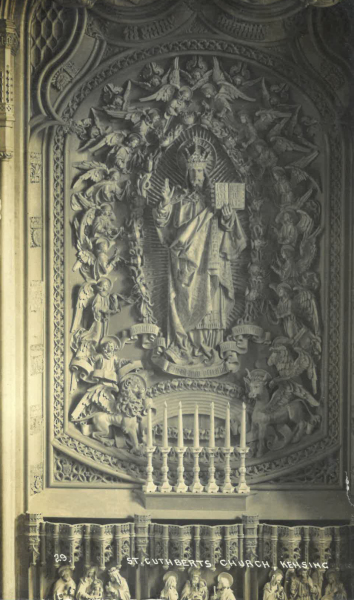 He made the tabernacle on the high altar in 1933, two years before his death. The most famous of his works in the church is the massive lectern (1897). John Betjeman, who greatly loved St Cuthbert’s, described its style as “Nouveau Viking”. You can read more on The stone carvers, and others: St Cuthbert's Church, a page on the Royal Borough of Kensington & Chelsea website by Dave Walker. Follow this link for a 360 degree tour of the inside of St Cuthbert's Church (with thanks to Nikhilesh Haval). 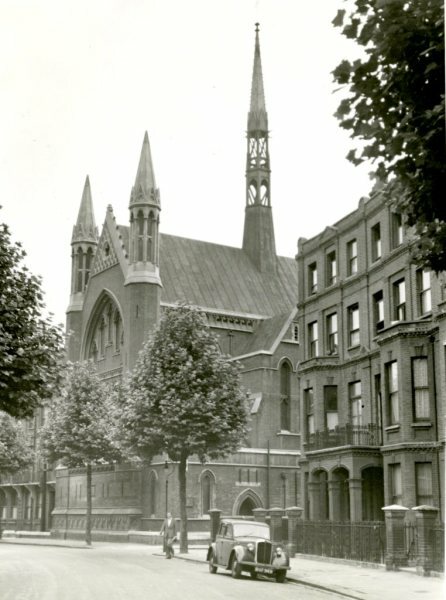 Visit our historical gallery page for further views of the church. St Cuthbert was born in 635 near Melrose in Scotland. In the year 651, while watching his sheep in the hills at night, he saw a vision: in a stream of light a company of angels descended to the earth, and having received a shining spirit, returned to their heavenly home. 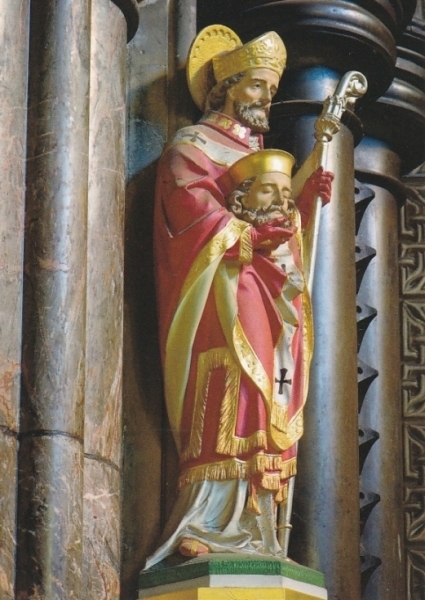 The next morning, St Cuthbert discovered that St Aidan had died at the very moment of his vision. St Cuthbert gave up being a shepherd and entered the Celtic monastery of Melrose in order to train as a monk. There he became known for his piety and learning. He then went to Ripon to help found the monastery there, but was expelled for refusing to accept the Roman monastic traditions. St Cuthbert returned to Melrose and was appointed Prior of the great monastery of Lindisfarne. His training in the Celtic tradition and his acceptance of the discipline of the new order helped him to persuade them to accept the change themselves. St Cuthbert remained the Prior of Lindisfarne until 676, when he retired to the nearly island of Inner Farne in order to live the life of a hermit. Here St Cuthbert spent his time in prayer and contemplation, having only seals and sea birds for company. However, he reluctantly agreed to accept the appointment as the Bishop of Lindisfarne in 685. He threw himself energetically into his new role, travelling widely and converting many to the Christian faith. Two years later, though, he retired from the post of the Bishop of Lindisfarne to return to his island hermitage where he died in 687. St Cuthbert’s body was carried to Lindisfarne and buried there, in accordance with his wishes. In the turmoil of the Viking raids his body was moved several times, finally arriving in Durham. His relics were moved in the new Cathedral to be enshrined behind the High Altar on 4th September 1104. The church is fortunate in the possession of four relics of its patron saint. One day a stranger came to the church and asked whether a relic of St. Cuthbert, well authenticated, would be acceptable. The grandfather of the intending donor had been present when the tomb of St. Cuthbert in Durham Cathedral was opened in 1827, and had been allowed to cut off a piece of the chasuble in which the body of the saint was vested. 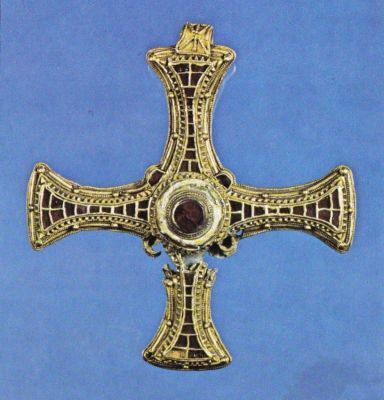 This had been preserved in the family and the members who survived determined that it should be given to a church dedicated to St. Cuthbert. Then followed a remarkable coincidence. Within a month of this incident, a lady in her 92nd year sent a message to say that if St. Cuthbert's, Philbeach Gardens, would care to possess a relic of St. Cuthbert, she would be prepared to give a piece of his stole which she had treasured for forty years. In 1847 Baron Alderson was Judge at the Durham Assizes and was taken by the Dean for a tour of the cathedral. Amongst other treasures he was shown St. Cuthbert's stole, which is still to be seen in the Chapter House there. The Judge was so deeply interested the relic that the Dean cut off a piece and presented it to him. The Judge gave it to his daughter, who later became the Marchioness of Salisbury, and she, while still a girl, gave it to the lady who presented it to this church. These two fragments exactly match in colour and are apparently of the same material. There is small piece of gold thread from the Saint's chasuble which is contained in a brass reliquary. Then, in the autumn of 1927, a gentleman called at the Clergy House and presented to the church two fragments of St. Cuthbert’s coffin. When St. Cuthbert’s tomb was opened in 1927 the saint’s remains were enclosed in a new coffin, pieces of the old one were as relics to certain people. A relation of the donor secured these two fragments, which together with the other relics have now been deposited in a reliquary, a small silver casket, given to the church by Colonel Breton. The reliquary is placed on the High Altar on St Cuthbert’s feast days, March 20th and September 4th. William Hunt St Cuthbert in S. Lee (ed.) Dictionary of National Biography, Vol. 13. London: Smith, Elder & Co, 1888.